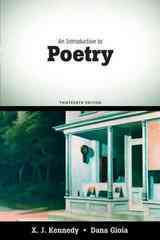 An Introduction to Poetry 13 Edition Kennedy/Gioia's An Introduction to Poetry, 13th edition continues to inspire students with a rich collection of poems and engaging insights on reading, analyzing, and writing about poetry. The authors of this bestselling book are the recipients of many prestigious poetry awards. Features new to this edition include: Exclusive conversation between Dana Gioia and U.S. Poet Laureate Kay Ryan, offer students an insider’s look into the importance of literature and reading in the life of this poet. More than 50 new selections—from a wonderful range of poets including Kevin Young, Bettie Sellers, Mary Oliver, David Lehman, Constantine Cavafy, Rainer Maria Rilke, Anne Stevenson, James Weldon Johnson, Alice Fulton, Jimmy Baca, Rita Dove, Gwendolyn Brooks, and Lorine Niedecker, among others. New 2009 MLA guidelines—provides students the updated source citation guidelines from the new 7th edition of the MLA Handbook and incorporates these in all sample student papers.